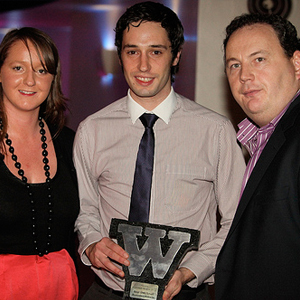 We are very proud to have been awarded the ‘Best SME/Small Business Website’ at this weekend’s Realex Irish Web Awards 2010 . The event was organized by Damien Mulley and his team (Mulley Communications) and hosted by the exuberant Rick O’Shea (Today Fm) in the grand setting of the Mansion House, Dublin . There were a number of new categories added to this years Irish Web Awards with ours being one of them – ‘Best SME/Small Business Website’. This was James Whelan Butchers first time being nominated at the Irish Web Awards and hopefully we will be back again next year. Big thanks to Damien Mulley, Pivotal Communications (sponsors of the SME/Small Business Category) and Sabrina Dent and Katherine Nolan for designing the site.